Today’s guest post is by Lauren Marinigh, www.twirltheglobe.com. For most people, visiting India is a culture shock on all levels. It’s a place rich in culture, tradition and religion, and when you hear people say that it truly awakens all your senses, including ones you didn’t even know you had, it’s true. I’m not really sure why India intrigued me so much, but it was an item on my bucket list I was eager to cross off and in December 2015, I did just that. India was eye opening, and although all trips seem to teach me more about myself and put my life into perspective, India seemed to teach me more than I ever expected. What I found the most eye opening was the country’s dedication to religion, traditions, and most importantly, family. India is said to be the birthplace of some of the world’s major religions like Hinduism and Buddhism, and religion still to this day plays an important role in the lives of Indians, with almost 80% practicing Hinduism. 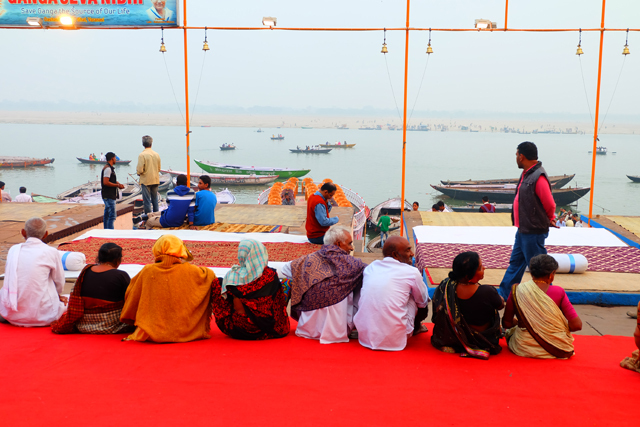 Visiting India, you see the dedication to religion everywhere you go, especially in places like Varanasi, the spiritual capital of India, and one of the holiest cities. Locals wake up before sunrise every morning to head down to the Ghats to wash themselves in the Ganges River, which is said to rid you of sins you’ve made in previous lives and a way to pay homage to loved ones that have passed. Every evening, hundreds of people crowd the same Ghats for a prayer ceremony filled with fire, music and what to us, seems like a performance. When you see the ceremony for the first time, it’s hard to believe that this big of a gathering happens every single night. It’s not hard to see the dedication Indians have to their religion and beliefs, something that I really respected coming from a Western society where religion is only practiced by some. I for example am a Catholic but haven’t been to church or practiced my religion since I was in high school, and it was part of the curriculum, so seeing a society so dedicated to their beliefs in something, is truly inspiring and admirable. Outside of a strong dedication to their religion, another part of the Indian culture that really stood out to me was their dedication to family. Yes, you can argue that mostly everyone is dedicated to their family, but India takes this to another level. Loyalty, integrity and unity are said to be the three pillars of family in India and everywhere you go, and anyone you talk to, will confirm this. I could go months without seeing members of my immediate family in Canada, but Indians usually have their families all living under one roof, and rarely do you see them spread far apart from their immediate family members. Households share income, food, work, religion, and major decisions, and elders are well respected for advice and guidance. Today, you do see joint families dividing out into smaller units under different roofs, but there is still a strong connection to your community and family. The odd nontraditional person may move far away from his/her family for job opportunities, but would still be sending money home to help support his/her larger family, if that was the case. Arranged marriages are still widely popular across India, and although you see some modern families focused on the young ladies in their families focusing on education, and building a career for themselves, the majority of families still practice the traditional marriage process. Parents play a major role in the marriage of their children, a practice that I can’t even imagine as a person coming from a Western country where you’re free to marry anyone you want. When speaking with my guide on my tour in India, he told me that when he started working for the tour company, and was often given groups of girls to tour around his country (due to the country being intimidating for solo female travelers), he was so anxious and overwhelmed. He grew up not talking to women outside of his family. He explained that when he was ready to get married, his family would select his wife, and usually they would already be married, living together, and having children before they even really knew each other or would consider themselves being “in love.” He emphasized that as an Indian, you naturally love children, and it is almost expected of you to have them. To me, as someone from the Western world, it’s easy to be close-minded to this approach on love and the family involvement in just about every decision in your life, but when you watch families and their closeness while in India, it speaks for itself. In India, you’ll see lots of poverty and lower standards of life then you would see anywhere else, but the one thing that is standing strong in this country is family. Yes, the standards of life in a country like Canada are better for many, but there is something our culture could learn about the importance of family and having faith in something greater than us. I’m even guilty of this, but as someone growing up privileged, in a first-world country, we often lose touch with what’s really important. We chase success, money, and materialistic things. Our society has raised us to live up to a certain standard—that success is more important than anything else. Success is what will define you, and what will make or break your life. But we often forget to take time to smell the roses, to remember how even at our lowest points in life, how fortunate we are. Traveling to India taught me to pay more attention to the people in my life, and the blessings I have to be thankful for. It made me realize I should sweat the small stuff, and I should learn to appreciate even the little things in life. Lauren is a Toronto-based blogger and marketing professional. Lauren’s blog, Twirl The Globe, was created to encourage and inspire other full-time professionals to get out there and see the world. You can follow Lauren on Twitter here, like her Facebook page here, or check out some of her photos on Instagram here. Great article. I love reading about India. Of all the places I’ve been to, India stands out as the place where you genuinely are ‘culture shocked’. Glad you felt that way and thanks for sharing, Russ! I’ve never been to India, but really would love to go!